Oakpark Alarms have taken on Carlo Hosegood as a Service/Installation Engineer to meet increased demand following their recent BAFE registration. Oakpark Alarms install security systems, including intruder alarm, CCTV and access control systems across Hampshire, Dorset, Wiltshire, Berkshire and Sussex. 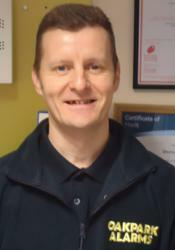 Oakpark Alarms are pleased to announce the appointment of Carlo Hosegood as a Service/Installation Engineer. Carlo has been involved in the security industry since his first appointment in 1984 and brings a wealth of experience to the Company, particularly with regard to Fire Installations, but also with Intruder Alarms, CCTV and Access Control. Although born and bred in the UK, Carlo's mother is Italian hence the Christian name. His hobbies include renovation of old motorbikes and he is a keen Radio Ham. Early in 2011 Carlo, along with five other Engineers, was made redundant by his employer when they closed a regional office. At that time, having heard good reports about Oakpark, he approached them to see if there were any vacancies but sadly, at that time, there were not. However, given his level of experience, Oakpark promised to keep his details on file in case the situation changed. With the increasing workload later in the year a decision was made to take on an additional Engineer and Carlo was therefore re-contacted as promised. Not surprisingly by then he had already been snapped up by another Company but despite this he agreed to ‘jump ship’ and join Oakpark. His experience and existing skill sets will be a great asset to the Company particularly in the Fire Sector where Oakpark Alarms BAFE registration is leading to a rapid increase in this market sector. Oakpark Alarms design, install and service fire and intruder alarms, as well as access control and CCTV security systems for both commercial and domestic locations. Established in 1984 and located on the Dorset/Hampshire border, Oakpark Alarms cover Dorset, Hampshire, Berkshire, Wiltshire and Sussex.